The fierce storms that pounded Delaware this winter caused such severe damage at Harbor of Refuge Lighthouse that its owner, Delaware River & Bay Lighthouse Foundation, has been forced to cancel all tours to the historic structure this summer. 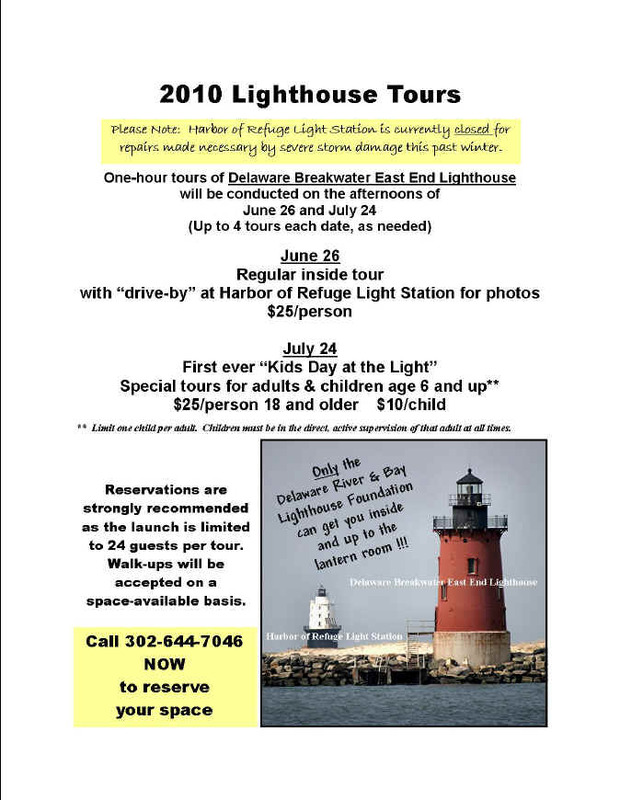 Tours to Delaware Breakwater East End Lighthouse will continue, but on a revised schedule. New plans for those tours are included below. Judith Roales, president of the foundation, said this is the worst damage at Harbor of Refuge since the preservation group began working there 11 years ago. There’s hardly a piece of the dock framework left above water, and the group is concerned about the stability of the dock pilings and support beams underwater, she explained. She said the group has not yet been able to get inside the lighthouse to inspect for interior damage. The group’s Board of Directors met in an emergency session April 10 to make plans for obtaining an underwater condition assessment, structural testing, and the engineering support for work that will have to be done to construct a new landing. The light at Harbor of Refuge was automated in 1972 and the historic 1926 lighthouse sat empty and deteriorating until the foundation began working on it in 1999. They opened it to public tours in 2002 and, under an agreement with the Delaware River & Bay Authority, added Delaware Breakwater lighthouse to the tours in 2006. The tours have been highly successful, with enthusiasts coming to the Lewes area specifically for the tours from as far away as Florida and Canada. Keeping a dock at Harbor of Refuge so tour participants can safely get onto the lighthouse has been one of the foundation’s biggest challenges. With its offshore location where Delaware Bay and the Atlantic Ocean come together, Harbor of Refuge is constantly buffeted by heavy seas and strong currents. The foundation quickly became accustomed to replacing the docks’ decking, railings, and stairs regularly. In recent years heavy metal grids were used as decking, and they were removed and stored in the lighthouse during the winter to prevent storm damage.